When a manufacturer says their leather is "distressed," they mean that it looks like you've put the miles on it when you haven't. To get that look on some modern leather, after it's been softened and treated, you have to buy it. The way old leather used to scuff was because it would dry, but now every stitch goes long before the leather gets the tell-tale signs of your riding history. River Road's Outlaw Vintage leather gloves reflect true to history wear patterns. Cuffs, high spots, and seams look like the leather is going, but they are still ready to accompany you for many miles ahead. The color is a rich dark brown that will match the rest of River Road's Vintage line or look just fine with most other gear. Perforated leather and four venting holes on the back of the glove will keep your hands cool on those sunny rides. A minor caution, so you're not disappointed if you think you're getting a different look: the holes on the back are not meant to go over the knuckles. There are no inset armor panels or carbon fiber protectors. 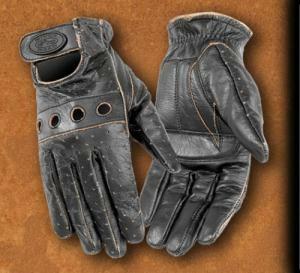 These classic cruiser gloves are just made to protect from cold, wind, and abrasion. River Road has included a gel pad in the palm to take the buzz out of your hands. These are fine leather gloves. They cost around $25, give or take a couple bucks, and River Road provides a one-year manufacturer's warranty. If you've been trying for years to break in a pair of gloves, only to have them mock you with indestructibility, these might satisfy that burning desire to have your efforts seen. Like the retro look? Check out this jacket from Members Only.